The latest installment in the Alien movie franchise, Alien: Covenant, came out many months ago, and the fan day dedicated to the franchise, Alien Day, April 26, is long past. But for many Alien fans, Alien Day is every day. For those loyal members of the xenomorph-worshipping tribe, a new augmented reality-powered book has arrived to serve their science fiction needs until the next film is released. The Book of Alien: Augmented Reality Survival Manual is exactly what it sounds like — a physical book that includes augmented reality content directly related to the franchise. Set for its US release on Tuesday, the book was written by movie and gaming journalist Owen Williams and is being published by HarperCollins. On the publisher's website, fans are told that, "With this book, you will learn how to clearly identify the threat — and which weapons you will need to successfully neutralize it." In addition to the three-dimensional ovomorph egg sacks and miniature xenomorphs that you'll soon find scurrying around your home in AR, you can also use the iOS and Android app (optimized for tablets rather than smartphones) to make an AR chestburster virtually emerge from anyone's body. The book also contains 100 photographs, as well as diagrams and text, all expanding on the details of the Alien franchise's lore. One of the biggest challenges the publishing industry has faced in recent years has been the rise of the e-books, but it turns out that our love affair with reading on a Kindle and iPad was mostly a brief blip in the digital disruption of paper books. Market reports now indicate that paper books are, in fact, on the rise versus e-books, despite our increasing reliance on digital media on desktop and mobile devices. 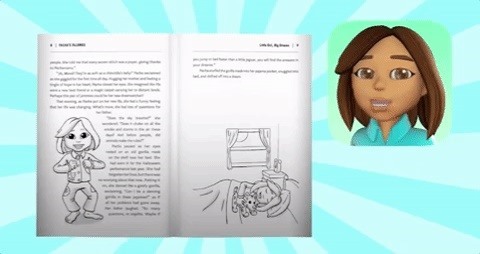 On the absolute opposite end of the spectrum, yet another traditional book harnessing the power of AR is a new children's book called Pacha's Pajamas, which uses AR to animate every child-friendly illustration on its pages. What's most interesting about the ambitious project is the fact that it isn't from a major distributor, it's from an independent publisher. The team behind the book is utilizing crowd-funding through Indiegogo to fund the product that includes a free AR app available for iOS and Android devices. For many indie publishers, e-books have served as a powerful alternative to navigating the slow-moving waters of major publishers. What the Pacha's Pajamas book project demonstrates is that, as with the democratization of book distribution through internet-powered e-books, indie publishers have no intention of allowing AR to be the sole domain of major publishers, either. So now that it appears paper books aren't about to disappear (at least for now), publishers, large and small, have an opportunity to merge a centuries-old information delivery mechanism with the very cutting edge next-generation interface of AR. Is this the future of print books and magazines, or just a temporary gimmick harnessing the latest development in computing? As usual, that's up to consumers, whether that's a science-fiction fan chasing aliens popping out of a movie tie-in book or children engaging fictional characters as illustrations come to life on the page. Either way, despite the publishing industry's relatively conservative technology profile, trends in the space move rapidly, so we'll know soon.